First, the technical achievement. Ziv et al, working in Mark Schnitzer’s group at Stanford have managed to record the firing activity of hundreds of hippocampal neurons over a period of approximately one month. 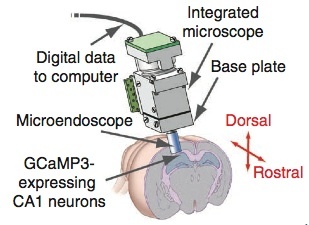 They do this by permanently mounting a miniature camera on the mouse’s head and using Ca+ imaging to identify the firing pattern of each neuron. John O’Keefe, using fine-wire electrodes implanted in the hippocampus cell layer, discovered ‘place cells’ in the 1970s. Place cells are hippocampal neurons recorded from freely moving animals that fire when the animal is in a restricted region of space: the cell’s firing field. 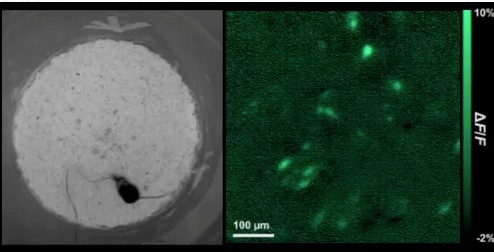 The electrode recording technique is terrific for recording from single cells, but limited in the number of neurons that can be recorded. In the years since O’Keefe’s discovery electrode-based recordings has slowly advanced to being able to record about 50 neurons. Optical recording techniques offer the potential of simultaneous recording many more cells, and identifying the anatomical relationship among the neurons. Ziv et al are the first to demonstrate place cells using optical recording techniques. With advances in miniaturization, stability, spatial resolution and temporal resolution, they are able to record up to 1000 neurons and track the activity of individual neurons up to 30 days. The biggest issue with Ca+ imaging is whether it can capture the spatial activity patterns of hippocampal neurons. Standard extra-cellular electrophysiological techniques capture sodium spikes, whose duration is under a millisecond. Calcium spikes are much slower. The situation in the hippocampus, however, may be fortuitous. Hippocampal pyramids commonly fire bursts of Na+ spikes (“complex spikes”) that trigger Ca+ spikes. In other words, tracking the occurrence of Ca+ spikes is likely the equivalent to tracking bursts of Na+ spikes. The proof is in the pudding: Will clear firing fields be observed when Ca+ spikes are plotted as a function of the animal’s location? The answer appears to be yes. The Ziv et al calcium-spike plots show spatial firing patterns with roughly the properties of Na+ spike plots. Although one would like to see that the firing plots of Ca+ and Na+ spikes are identical, the results, to me, are convincing. Most impressive is the appearance of the spatial patterns and, when a cell remains in the active subset, the stability of its firing pattern across days. spatial distribution of Ca+ spikes from 2 cells in two chambers. Ca+ spike traces. Trace width is 10s (I think). Although spikes are clear, each is long duration. Ziv et al, part of fig 1. With this remarkable technology in hand, the Stanford group asked the question of how the set of place cells changes spatial properties across the 30 day span, addressing the question of “mapping” and “remapping”. To understand the underlying question requires some background. Hippocampal Place Cell recorded in a cylinder. Dark colors are high-rate pixels. The spatial relations among the firing fields of the active subset of cells. For any pair or cells, the firing fields can be characterized as overlapping, neighboring or disjoint. The notion is that a “map” is acquired in a novel environment. When learned the map contains information about the environment identity, its shape, routes within the environment, and, perhaps, events that occurred within the environment. 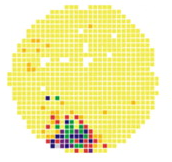 Approximately 25% of the cells formed the “active subset” of place cells on a given day. The active subset changed from day to day. When recorded 2 days apart, the overlap was 25%; when 30 days apart the overlap was 15%. When a cell participated in the active subset across any pair of days, its firing field remained in a fixed location. That is, it was not part of a “remap”. Even though only 15% of the neurons remained in the active subset across 30 days, these neurons retained their firing fields. This is sufficient to identify the environment and identify the mouse’s location within the environment. Left: mouse. Right: snapshot of Ca+ activity in CA1 hippocampal neurons. Ziv et al frame from supplementary video. The authors speculate that the change the map over time provides a possible linkage between spacial representation and episodic memory. Here, I take the numerical values of members in the active subset and explore this hypothesis in greater detail. Recall that over two days only 25% of the cells remain in the active subset. If all cells in the active subset are equally labile and have an equal decay constant, this leads to the estimate that 75% of the active subset is exchanged every two days. Over 30 days, zero remaining cells between days 0 and 30 (25^15 or 10^-9). But the constant cells after 30 days is 15%, not zero. Perhaps the active subset has two components: a temporally-varying component and a stable component, with the two of roughly equal size. This might provide an elegant solution: the stable component might provide stable memory for environments while the temporally-varying component would link episodic events to stable environments. From Mankin et al S5. 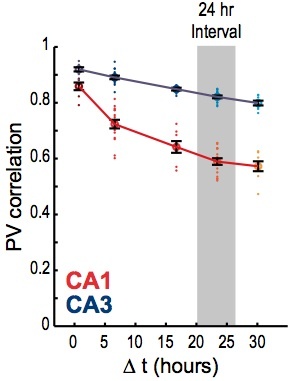 Population vector spatial correlations with the original session decrease with time in CA1, less in CA3. Update. On Feb 20, a day after writing the initial blog post, I realized that a recent paper by Mankin et al (2012) deals with similar issues*. The Mankin et al study uses traditional electrode recording techniques in rats and examines the stability of the map representation of an environment over a 24-hour (plus) span. The results appear to be consistent with the optical recording study. Mankin et al find that the CA1 map representation changes steadily and dramatically over a 24 hour period. Interestingly, Mankin et al also recorded in CA3, where maps showed greater stability. Differences in analytic techniques make it difficult to make numeric comparisons between the studies. Nonetheless, the two reports point the same direction. In addition, together they illustrate the relative strength of the two approaches. The Mankin et al study uses classic techniques (making comparison with other work much easier), records Na spikes rather than Ca spikes and permits analysis of both CA1 and CA3. The Ziv et al study records many more cells and tracks activity patterns over a much greater time span. Update 2. March 10, 2013. In email exchanges from Mark Schnitzer it appears that the time calibration bar in the fig above is, indeed, 10s. That makes each Ca+ burst very long, almost 10s. He says that the influx durations are variable. They mark the mouse’s location at the onset of the influx. In sum, the Stanford study supports the map concept and demonstrates important properties of mapping, remapping and map stability. Perhaps most importantly, the ability to record hundreds or thousands of neurons over a broad time span provides tools to study the linkage between space and episodic memory. * Mankin, E. A., Sparks, F. T., Slayyeh, B., Sutherland, R. J., Leutgeb, S., & Leutgeb, J. K. (2012). Neuronal code for extended time in the hippocampus. Proceedings of the National Academy of Sciences of the United States of America, 109(47), 19462–19467.